Another year has gone and the garden is walking its path to become a more and more diverse, more self-sustaining permaculture space. Here is the summary of the first year. After last year’s lack of water, we had a good season this Winter, regarding rains. Composting on the ground could speed up. By now the garden smells like a forest, soil smells like forest-soil, after rains. Right now, in October 2017, we had a very unusual amount of rain in September. One can really sense that by walking among the trees. 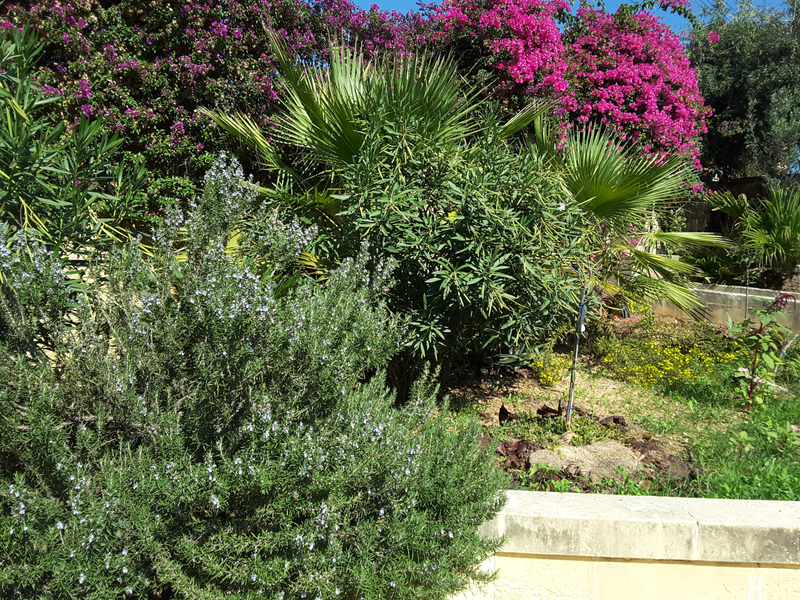 It is humid and smells just like a real Mediterranean forest, we have so little of here, in Malta. Throughout the year, the major focus was still on soil improvement. However, we managed to grow a lot more edible plants, that you can see in the pictures. We also managed to plant some new fruit trees and grapes. Slowly-slowly, step-by-step, we replace dying plants with edible ones. Vermiculture bath tubs are doing very well, consuming all the kitchen waste, generated in the Villa and even more, as sometimes visitors bring their kitchen waste as well. Worms seem to enjoy their lives, propagating, and creating great quality worm manure, that is used for planting on-site, of course. Flowering weeds are allowed to stay, we do basically no weeding. Lovely little wild Maltese plants provide extra food for bees and other pollinators, that seem to enjoy the chemical-free spots of plants. And after these plants die, they stay on the ground as mulch, and eventually return to the soil as compost. This is the very beauty of life, life cycles, material and energy cycles. After two years, all the structures and elements are now fully functional. Garden processes are integrated with the kitchen processes and the overall management of the house. 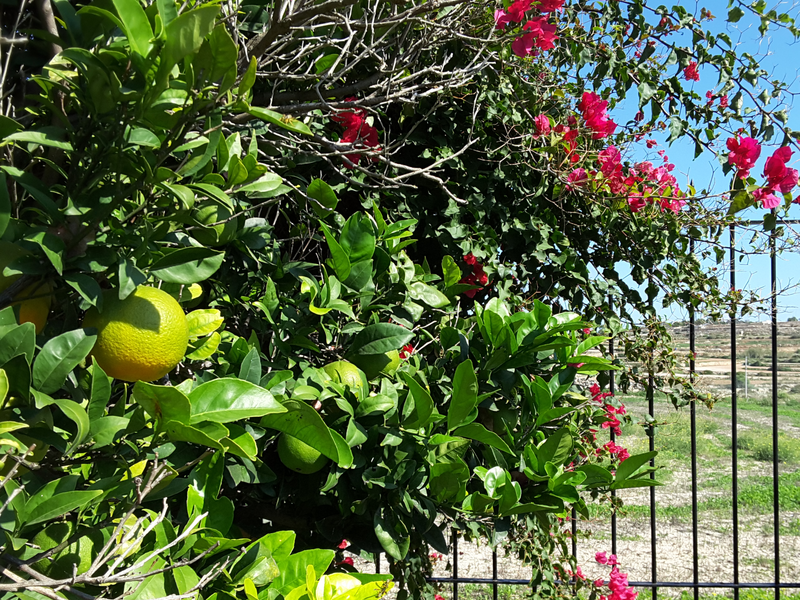 People, helping out with the maintenance of Juno Heights, are aware of the ecological processes and contribute to the garden-processes in a very useful way, by for example collecting green waste and using worm-manure in a systematic and conscious way. The plan for next year is to further boost the energy and material cycles of the garden, as well as to produce more organic edible plants for human consumption. We are now in the stage where we start organising open days and trainings, related to permaculture and more environmentally friendly gardening methods. We set up a facebook group recently, and would like to develop it into an online community learning environment supplementing the onsite trainings. You are more than welcome to join the FB group here. But again, let us show you the pictures to tell the story of the year. Click on the image below to view them. You can find explanations if you click on the “i” icon by each picture. Have fun, and if you are interested, join the group and follow the FB page of Juno Heights Garden, a developing permaculture paradise.